He made his mark early as he began his NFL career with the Lions with an incredible 23 sacks (an unofficial stat at that time) his rookie year, with five sacks in a single game against the Tampa Bay Buccaneers. 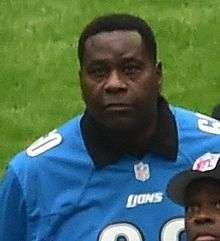 He played for the Lions for five seasons, starting 66 of 67 games. In his last season with the Lions, 1982, when sacks became an official statistic, he totaled 8.5 in only nine games. He also had two career interceptions with the Lions. During his career with the Lions he un officially totaled 75.5 sacks including 23 sacks in 1978, 16 in 1979 18 in 1980 and 10 in 1981 . He played the next four seasons, 1983–86, with the St. Louis Cardinals, for whom his season sack totals were 13, 10, 4 and 10.5. The sack-master holds the franchise's top three all-time, single-season sack efforts. IN 1983, along with the 13 sacks, he also had two interceptions. In 1987, he was a reserve defense lineman for the Cleveland Browns, then served in the same position in 1988 for the Minnesota Vikings. He returned to the Browns as a starter for all 16 games of the 1989 season as well as for all nine games he played for the Browns in 1990, his final NFL season at age 34. Bubba Baker now lives with his family, including his wife of 30 years, Sabrina, in Avon, Ohio, a suburb of Cleveland, and he owns a restaurant called Bubba's Q World Famous Bar-B-Que & Catering in Avon. He appeared on the ABC-TV show Shark Tank on December 6, 2013 in which investor and entrepreneur Daymond John agreed to invest, for a 30 percent share, in Queen Ann Inc., the food company started by Baker and Baker's children, Brittani Bo Baker and James Albert London Baker. Part of the agreement was the licensing of Baker's patent for de-boning pork ribs. In 2004 he was picked as the 9th Greatest Pass Rusher in NFL History by Sports Illustrated. In 2007, he was named to the Greater Cleveland Sports Hall of Fame.